Post-election trauma was expected to dampen the holiday sales as most retailers were worried that consumers would be emotionally hungover from the elections. However, the recent Thanksgiving, Black Friday and Cyber Monday sales news have turned out to be quite unexpected and shocking. Consumers have spent $12.81 billion between November 24th and November 28th which is an increase of 16.4% from last year. Adobe’s data was grouped from 22 billion visits to retail websites and over 80% online transactions from the top 100 U.S. retailers. For the first time, Black Friday online sales surpassed $3 billion mark where the day closed with $3.34 billion which is a 21% increase of 2015. 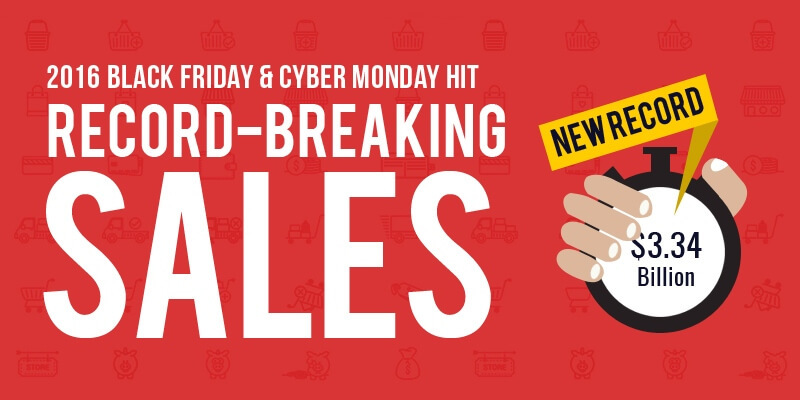 While the Black Friday sales made a record, the Cyber Monday sales didn’t disappoint us either when it surpassed Black Friday sales to become the biggest online sales day in history with $3.36 (outside of Ali Baba’s Single’s Day!). Thanksgiving saw a huge soar in mobile shopping where it recorded $771 million revenue. Most retailers like Amazon, Walmart and Target said that mobile drew almost 60-70% traffic on Thanksgiving. Although Cyber Monday mobile sales didn’t break through Black Friday, a total of $2.2 billion ($1.13 billion on Black Friday and $1.07 billion on Cyber Monday) revenue was generated over mobile. This has become the highest mobile sales ever over a weekend which stresses on the importance of featuring responsive/mobile friendly online stores. More than 50% of sales on Cyber Monday was on mobile devices. Although mobile sales drew high traffic and revenue, smartphones saw a lesser conversion rate of 1.9% than desktops and mobiles. While driving the necessary traffic is highly important, retailers must understand the fact that only when you optimize your website with the right conversion optimization mechanisms, will help you convert potential consumers. From Thanksgiving to Cyber Monday, Apple has distinctly won over Android. The average order value for iOS on Black Friday was $144 and Android was $136. Similarly, iOS ruled Cyber Monday with an average order value of $139. With that said, the holiday season has only begun and we have more than a month to witness the sales surge and other updates. So, how did your online store perform during the week end? There are many factors that can ruin or make great sales. Did you face any website outages that required immediate support or affected your sales? If yes, you certainly wouldn’t want to lose more in the coming days. Our Maintenance and Support team will be available round the clock to assist you in any ways possible.